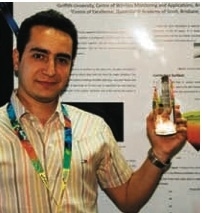 Amin Ahmadi completed his PhD at Griffith University in conjunction with the Queensland Academy of Sport. He received a scholarship from the Centre of Excellence in sports science. He has completed his MSc program in computer and communication engineering at Griffith, Australia in 2005. He is a member of IEEE, Sports Medicine Australia and the Centre of Wireless Monitoring and Application at Griffith University. His main research area of interest isin monitoring and enhancing the performance of Tennis Players using inertial sensors. He also won the Minister Excellence Award in “Innovation and Creativity” in 2006 and a best poster award at the Sports Medicine Australia conference in 2008.